2017 is on its way out and, while much remains the same, a lot has changed for the better when it comes to the success of small businesses. The markets are up, unemployment is down, and consumer confidence hit a 17 year high in October. While many small businesses face challenges in getting proper funding and competing against larger rivals, these leaner businesses tend to be agile and innovative so they can swiftly respond to new opportunities, technological advancements, customer needs, and other market forces. Listed below are 9 trends that small businesses should keep an eye out for in 2018 and some methods to prepare for them. There’s a bubble out there but no one is exactly sure what this means or where it is. Stocks have ascended to crazy heights with price-to-earnings ratios well above their “normal” ranges. 2018 seems to be pushing hard for a burst bubble. One of the reasons individuals might be stockpiling their bookkeeping monetary leaps for joy could be that a lot of the people getting richer are the millennials, a disreputably anxious and cautious market group. The internet of things (IoT), artificial intelligence (AI), and machine learning (ML)— were the buzzwords that Big Tech couldn’t stop chatting about in 2017. Expect more of the same in 2018. Okay, “Made in America” hasn’t actually gone anywhere, but it has been a smaller movement in recent years. This year, American products and jobs have often been a focus of the Trump Administration, leading to a reassessment of U.S. trade agreements and tariffs. While it’s simmering as a social dispute right now, in 2018 American made will be a big deal. In 2018, you’re going to get hacked. Maybe it’ll be personal, maybe it’ll be your business. One way or another, you’re going to have to put up with someone getting their hands on something you’d rather they didn’t. With nothing to lose for market indolence, large corporations will continue letting standards slide, which means you and your customers are going to have to deal with the repercussions. Within a few weeks, New York City’s new scheduling bookkeeping laws will take effect for fast food and retail employees. These laws have a lot of insinuations, with the largest surrounding changing employee working patterns. Your phone now knows where you are at all times, which means that every app you’ve distractedly installed and permitted location access knows where you are too. The uncanny valley is just around the corner, though. Soon, you’ll open your phone and get an ad from the store you’re in proposing a substitute for something you searched for on your laptop. That’ll give even the most enthusiastic tech adopters among us an instant of pause. While the future won’t be office-free, that’s a number that’s only going to rise in 2018. Employees and employers both get something out of remote work, though the overall benefit hasn’t been proven. Remote workers get to work from the comfort of their own home, while managers need to buy fewer desks and less office space. We all know that trusting random online businesses is a bad choice. In 2018, that will start changing. In part, it’s going to be a function of privacy concerns. A larger part will be driven by a handful of businesses that see the dual value in retailing a product that doesn’t rely on personal information but does rely on edge computing power. 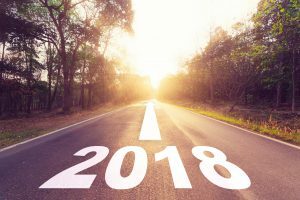 In 2018, we’ll see a little more of the same, some new directions here and there, and consumers realizing the power they exert. As we move into 2018, some of this momentum will remain, some will get lost, and—hopefully—we’ll pick up some new steam as well.